Business relocation is something that lots of companies face at some point. Some businesses grow rapidly and need to upgrade from their current building, while others need to downsize or move to another city or state. Whatever the case may be, office moving is no simple task, and it takes the help of professional packers and movers to get the job done safely and efficiently. After all, it’s your business that is at stake, not boxes of clothing and other household knick knacks. At Pack N Move, we provide office moving services to businesses of all sizes in Visalia and Fresno, and our office movers are ready to get you where you need to go. We also offer professional packing services to ensure that all your computer monitors, filing cabinets, office supplies, and other essentials stay put in the moving truck. Contact us today to use our business relocation services, or continue reading for some tips to help you organize for an office move! If you own a business and know that you’ll need to move to another building, city, or state, it is essential that you start planning for the move as early as possible. Like residential moving, commercial moving can be a daunting task if nothing is done to prepare until the weeks leading up to moving day, and the last thing you want is to irritate your employees and customers by procrastinating. Establish a realistic timeline of when certain things need to be done in order to keep you on track for your office’s moving day. It goes without saying that office moves are not a one-man job, even if you do hire a commercial moving company to do all the packing and moving for you. If you own a small business, make sure that everyone is on the same page about what needs to be done and delegate tasks, like donating outdated office equipment, notifying the utility company and post office, clueing in clients/customers, etc. Whereas small businesses may only need several months to half a year to prepare, larger businesses may need well over 6 months to get their ducks in a row with heads of departments, management, and supervisors. Once you’ve set a timeline for what needs to get done and when, as well as who will be in charge of certain tasks, you can start to envision your business in the new space. 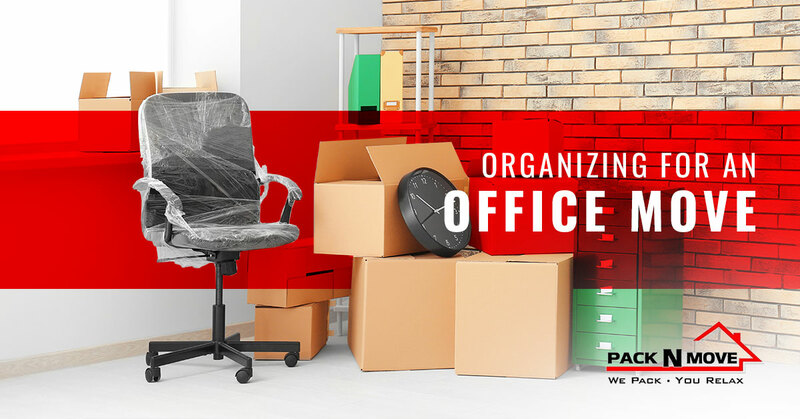 This will help you purge your current office of clutter and unnecessary items, like old office equipment that can be donated or thrown away. To get your employees excited for the move, you might consider asking for their input on how the new office space should be laid out. Consider seating arrangements, use of communal rooms, decor, and more. Now that you’ve done all the organizing and planning, it’s time to research the best moving companies in your area. Again, since this is your brainchild that you’re moving, it’s important to hire the right packers and movers for the job so you don’t end up with a disaster or costly repairs on your hands. Make sure that your commercial movers are licensed and bonded, and get an estimate long before moving day. That way, you can rest assured that you and your company’s assets are in good hands. Looking for a local moving company to assist with your business relocation? We’ve got you covered. Contact Pack N Move today to get a commercial moving quote in Visalia or the surrounding area!